Pericarditis is an inflammation of the two layers of the thin, sac-like membrane that surrounds the heart. This membrane is called the pericardium, so the term pericarditis means inflammation of the pericardium. Pericarditis is fairly common. It affects approximately one in 1,000 people. The most common form is caused by infection with a virus. People in their 20s and 30s who have had a recent upper respiratory infection are most likely to be affected, along with men aged 20-50. One out of every four people who have had pericarditis will get it again, but after two years these relapses are less likely. The viruses that cause pericarditis include those that cause influenza, polio, and rubella (German measles). In children, the most common viruses that cause pericarditis are the adenovirus and the cocksackievirus (which is most likely to affect children during warmer weather). Although pericarditis is usually caused by a virus, it also can be caused by an injury to the heart or it can follow a heart attack. It may also be caused by certain inflammatory diseases such as rheumatoid arthritis or systemic lupus erythematosus. Bacteria, fungi, parasites, tuberculosis, cancer or kidney failure may also affect the pericardium. Sometimes the cause is unknown. There are several forms of pericarditis, depending on the cause. This is caused by infection with a virus, bacteria, or fungus—usually in the lungs and upper respiratory tract. This form of the disease causes a sharp, severe pain that starts in the region of the breastbone. If the pericarditis is caused by a bacteria, it is called bacterial or purulent pericarditis. Sometimes fluid collects between the heart and the pericardium. This is called pericardial effusion, and may lead to a condition called cardiac tamponade. When the fluid accumulates, it can squeeze the heart and prevent it from filling with blood. This keeps the rest of the body from getting the necessary supply of oxygen and can cause dangerously low blood pressure. A cardiac tamponade can happen when the chest is injured during surgery, radiation therapy, or an accident. Cardiac tamponade is a serious medical emergency and must be treated immediately. When the pericardium is scarred or thickened, the heart has difficulty contracting. This is because the pericardium has shrunken or tightened around the heart, constricting the muscle's heart movement. This usually occurs as a result of tuberculosis, which now is rarely found in the United States, except in immigrant, AIDS, and prison populations. In cardiac tamponade, neck veins may be swollen and blood pressure may be very low. The heart of a person with pericarditis is likely to produce a grating sound (friction rub) when heard through a stethoscope. This sound occurs because the roughened pericardium surfaces are rubbing against each other. electrocardiograph (ECG) and echocardiogram to distinguish between pericarditis and a heart attack. x ray to show the traditional "water bottle" shadow around the heart that is often seen in pericarditis where there is a sufficient fluid build up. computed tomography scan (CT scan) of the chest. heart catheterization to view the heart's chambers and valves. pericardiocentesis to test for viruses, bacteria, fungus, cancer, and tuberculosis. blood tests such as LDH and CPK to measure cardiac enzymes and distinguish between a heart attack and pericarditis, as well as a complete blood count (CBC) to look for infection. Since most pericarditis is caused by a virus and will heal naturally, there is no specific, curative treatment. Ordinary antibiotics do not work against viruses. Pericarditis that comes from a virus usually clears up in two weeks to three months. Medications may be used to reduce inflammation, however. They include nonsteroidal anti-inflammatory drugs (NSAIDs), such as ibuprofen and aspirin. Corticosteroids are helpful if the pericarditis was caused by a heart attack or systemic lupus erythematosus. Analgesics (painkillers such as aspirin or acetaminophen) also may be given. Cardiac tamponade occurs when fluid collects in the pericardial sac between the heart and the surrounding pericardium. A medical emergency, cardiac tamponade deprives the body of oxygen and requires immediate treatment. parts of the pericardium that are preventing the heart from beating correctly. If a cardiac tamponade is present, it may be necessary to drain excess fluid from the pericardium. Pericardiocentesis, the same procedure used for testing, will be used to withdraw the fluid. For most people, home care with rest and medications to relieve pain are sufficient. A warm heating pad or compress also may help relieve pain. Sitting in an upright position and bending forward helps relieve discomfort. A person with pericarditis may also be kept in bed, with the head of the bed elevated to reduce the heart's need to work hard as it pumps blood. Along with painkillers and antibiotics, diuretic drugs ("water pills") to reduce fluids may also be used judiciously. Prognosis is good. Most people recover within three weeks to several months and do not need any additional treatment. Computed tomography (CT) scan — A CT scan uses x rays to scan the body from many angles. A computer compiles the x rays into a picture of the area being studied. The images are viewed on a monitor and printed-out. Echocardiogram — An echocardiogram bounces sound waves off the heart to create a picture of its chambers and valves. Electrocardiogram (ECG) — An ECG is a test to measure electrical activity in the heart. Heart catheterization — A heart catheterization is used to view the heart's chamber and valves. A tube (catheter) is inserted into an artery, usually in the groin. A dye is then put into the artery through the tube. The dye makes its way to the heart to create an image of the heart on x-ray film. The image is photographed and stored for further examination. Pericardiocentesis — Pericardiocentesis is a procedure used to test for viruses, bacteria, and fungus. The physician puts a small tube through the skin, directly into the pericardial sac, and withdraws fluid. The fluid then is tested for viruses, bacteria, and fungus. Pericardium — The pericardium is the thin, sac-like membrane that surrounds the heart. It has two layers: the serous pericardium and the fibrous pericardium. There is no way to prevent pericarditis, but a healthy lifestyle with proper nutrition and exercise will help keep the body's immune system strong and more likely to fight off invading microorganisms. inflammation of the pericardium. adj., adj pericardit´ic. Types of Pericarditis. There are many forms of pericarditis. Acute pericarditis is usually secondary to some other bacterial infection, such as osteomyelitis, lung abscess, or pneumonia. It may also occur without bacterial infection, resulting from a tumor, rheumatic heart disease, uremia, coronary thrombosis, myocardial infarction, chest wound, or surgery in which the pericardium is pierced. It may be dry, or fibrinous, with a fibrinous exudate on the serous membrane, or accompanied by effusion, accumulation of fluid in the pericardial cavity. Occasionally the pericardium is affected directly by what appears to be a virus; this condition is called acute nonspecific pericarditis. Another form, chronic pericarditis, is usually adhesive; that is, the heart is anchored to surrounding tissues by adhesions. It sometimes follows acute pericarditis, but often the cause is unknown. In its constrictive form (chronic constrictive pericarditis), which may be tuberculous in origin, calcium and fibrous deposits may form around the heart and interfere with its movements. This form may be extremely serious and difficult to cure. Symptoms and Treatment. The symptoms of acute pericarditis vary with the cause but usually include chest pain and dyspnea, an increase in the pulse rate, and a rise in temperature. There is often a pericardial friction rub with serial changes on the electrocardiogram. In dry pericarditis the friction rub is distinct, caused by deposits of fibrin, and may be heard through a stethoscope. In the effusive form, the excess accumulation of pericardial fluid can be detected by x-rays or electrocardiography. The excess fluid is sometimes drained by pericardiocentesis. Treatment of acute pericarditis is directed mainly at curing its original cause. Antibiotics have proved successful in treating bacterial pericarditis. Many patients with nonspecific pericarditis with effusion are helped dramatically by cortisone medications. In the constrictive form of chronic pericarditis there may be dyspnea and pain in the heart region, plus symptoms elsewhere in the body, such as edema, enlargement of the liver, or distention of the neck veins. The best means of treatment is surgery to remove the constrictions and permit free heart action. 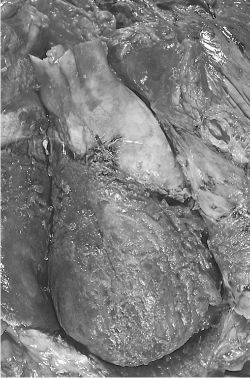 adhesive pericarditis a condition due to the presence of dense fibrous tissue between the parietal and visceral layers of the pericardium. constrictive pericarditis a chronic form in which a fibrotic, thickened, adherent pericardium restricts diastolic filling and cardiac output, usually resulting from a series of events beginning with fibrin deposition on the pericardial surface followed by fibrotic thickening and scarring and obliteration of the pericardial space. fibrinous pericarditis , fibrous pericarditis that characterized by a fibrinous exudate, sometimes accompanied by a serous effusion; usually manifested as a pericardial friction rub. pericarditis obli´terans , obliterating pericarditis adhesive pericarditis that leads to obliteration of the pericardial cavity. inflammation of the pericardium associated with trauma, malignant neoplastic disease, infection, uremia, myocardial infarction, collagen disease, or unknown causes. See also acute nonspecific pericarditis. observations Two stages are observed if treatment in the first stage does not halt progress of the condition to the extremely grave second stage. The first stage is characterized by fever; substernal chest pain that radiates to the shoulder or neck; dyspnea; a dry, nonproductive cough; a rapid and forcible pulse; a pericardial friction rub; and a muffled heartbeat over the apex. The patient becomes increasingly anxious, tired, and orthopneic. During the second stage a serofibrinous effusion develops within the pericardium, restricting cardiac activity. If the effusion is purulent (caused by bacterial infection), a high fever, sweat, chills, and prostration also occur. The heart sounds become muffled, weak, and distant on auscultation, and a bulge is visible on the chest over the precordial area. interventions The patient is kept in bed, and the head of the bed is elevated 45 degrees to decrease dyspnea. Hypothermia treatment may be necessary to reduce the body temperature. An antibiotic or antifungal and analgesic may be ordered. Oxygen and parenteral fluids are usually given, vital signs are evaluated, and the chest is auscultated frequently. Pericardiocentesis or pericardiotomy may be performed to remove accumulated fluid or to make a diagnosis. nursing considerations Emotional support of a patient being treated for pericarditis requires remaining with the person if he or she is anxious and explaining all procedures thoroughly. During recovery, rest periods are planned and the person is urged to avoid fatigue and exposure to upper respiratory infections. The patient is told to report symptoms of recurrence, including fever, chest pain, and dyspnea. Cardiology Inflammation of the pericardium Etiology Infection–eg, polio, influenza, rubella, adenovirus, coxsackieviruses, TB, rheumatic fever, injury or trauma to chest, esophagus, heart; systemic diseases such as CA, kidney failure, leukemia, AIDS or AIDS related disorders, autoimmune disorders, acute MI, myocarditis, RT to chest, immunosuppressants Clinical Pain due to rubbing of pericardium against heart, pericardial effusion Types Bacterial pericarditis, constrictive pericarditis, post-MI pericarditis DiffDx Restrictive cardiomyopathy. See Bacterial pericarditis, Constrictive pericarditis, Dressler syndrome. Inflammation of the membranous bag surrounding the heart (the PERICARDIUM). Pericarditis may be associated with an accumulation of fluid (pericardial effusion) in the pericardial sac or with adhesions between the layers of the sac. Either may embarrass the heart action. Treatment may involve withdrawing fluid through a needle or surgery to relieve constriction. an inflammation of the PERICARDIUM. Dressler beat - presence of Dressler beats strongly supporting the diagnosis of ventricular tachycardia by interruption of it. n an inflammatory condition of the pericardium associated with malignant neoplastic disease, trauma, uremia, infection, collagen disease, or myocardial infarction. n an inflammation of the pericardium associated with trauma, malignant neoplastic disease, infection, uremia, myocardial infarction, collagen disease, or idiopathic causes. inflammation of the pericardium. Initially there is an audible friction rub on auscultation. Later as fluid accumulates there is a muffling of the heart sounds and sometimes a washing machine sound on auscultation. Congestive heart failure develops terminally. Classified according to exudate produced as fibrinous, fibrinohemorrhagic, hemorrhagic, purulent. see bread and butter pericarditis. adhesions between the epicardium and pericardium limit the movement of the heart sometimes sufficiently to cause congestive heart failure. occurs in cattle and goats, rarely sheep, when a sharp foreign body is swallowed and lodges in the reticulum, subsequently perforating its wall. The perforation may go as far forward as the pericardial sac, especially if the animal is pregnant. The animal dies of a combination of congestive heart failure and toxemia due to the bacterial infection. Among the 40 patients, 11 patients were diagnosed with pericarditis (27. Q waves may be present in post-myocardial infarction (MI) pericarditis. Ninety percent of my patients have pericarditis following a bout with a virus such as the flu or from unknown causes," Dr. However, pericarditis can occur even in the absence of pericardial fluid collection (5). Recurrent pericarditis after meningococcal infection. More than 80% of pericarditis cases in developed countries are idiopathic and are assumed to have a viral source. La pericarditis constrictiva puede ocurrir despues de cualquier proceso de enfermedad pericardica o bien como manifestacion de enfermedad sistemica. Constrictive pericarditis is a rare cause of HF and is potentially curable. Since the patient immigrated to Israel from Ethiopia where TB is endemic and since she had hemorrhagic pericardial effusions with very low glucose levels and in the absence of a response to anti-inflammatory drugs, TB pericarditis was highly suspected and empiric antituberculous therapy was added to colchicine and prednisone. Pericarditis is the most common site of cardiac involvement in SLE affecting up to 48 percent of patients (majority of studies reported 20 to 30 percent).